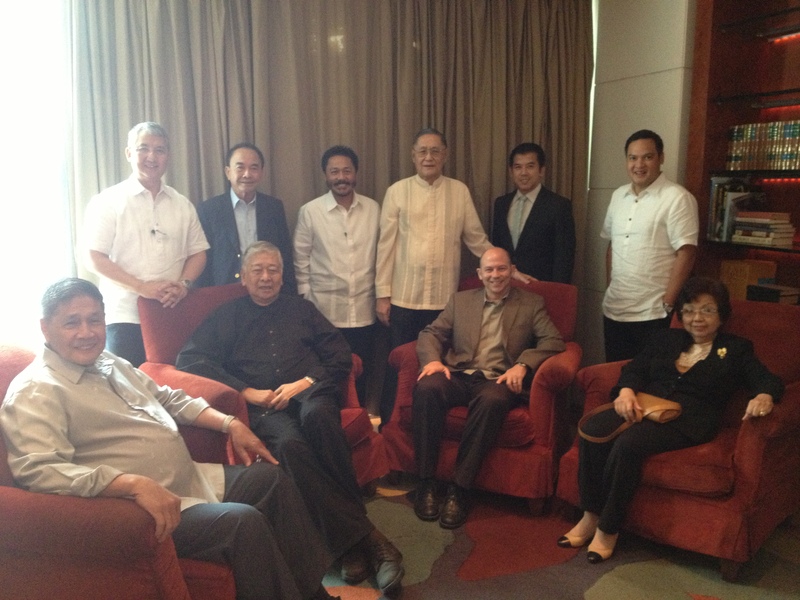 Had a wonderful reception in the Philippines by many local Eisenhower Fellows. What a distinguished group! Standing (L-R): Dan Songco MNP 99, EFAP vice-chair and executive director; Ping de Jesus MNP 77, EFAP trustee; Omar Cruz SNP 86, EFAP Trustee; Ramy Hermano MNP 58, EFAP trustee; Dondi Silang MNP 2000; Gov. Migs Dominguez MNP 2009. Unfortunately we only thought to take this photo after the very gracious Jaime Augusto Zobel de Ayala had left. Lunch was fantastic and the conversation was freewheeling and stimulating. Mr. Zobel led the discussion on what makes Filipino society distinct in the world, and the whole group joined in on a variety of perspectives. My big take away was that many Westerners think that Filipinos are western in spirit because of their longstanding relationship with Spain, USA and their widespread use of the English language. However, the Philippines has a rich history of many tribal and ethnic groups that still inform their mentality and choices far more than a Western ideology. This insight was invaluable as I started my journey in this diverse country. But this same group of distinguished leaders had a fun and hip spirit as well, and so our conversation had a lot of laughter and covered a lot of ground – including music, the effect of expatriates, and the amount of YouTube views of Gangnam Style. This entry was posted in Eisenhower, Philippines and tagged Ben Sanchez, Dan Songco, Dondi Silang, Gangnam Style, Gen. Billy Villarea, Gov. Migs Dominguez, Jaime Augusto Zobel de Ayala, Lilia Bautista, Omar Cruz, Ping de Jesus, Ramy Hermano on October 30, 2012 by aly.